John Pollock reviews WWE Raw from June 17, 2002, leading into the King of the Ring, which we will review on Friday’s Rewind-A-Wai. This show dealt with the fallout of Steve Austin walking out on the company the previous week and the return of The Rock. Wai Ting reviews the return of Total Bellas from this past Sunday with the ongoing drama of Nikki Bella and ARTEM! A review of Being the Elite Episode 138 “Alpha and Omega” covering AEW’s press conference in Las Vegas, the announcement of the rematch between Kenny Omega and Chris Jericho, and the crew attends the Super Bowl. 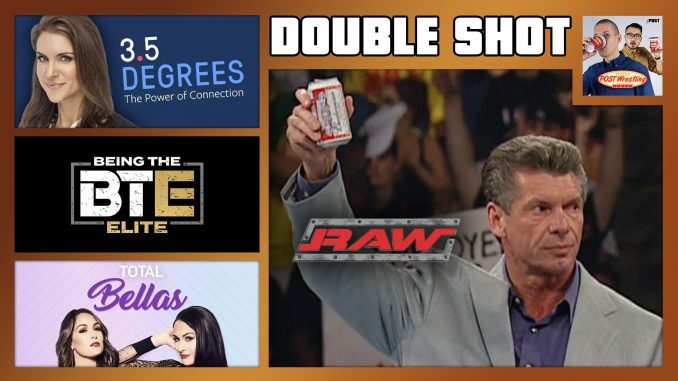 Plus, John & Wai recap Stephanie McMahon’s recent interview on Facebook’s 3.5 Degrees podcast discussing her ascension in the company.